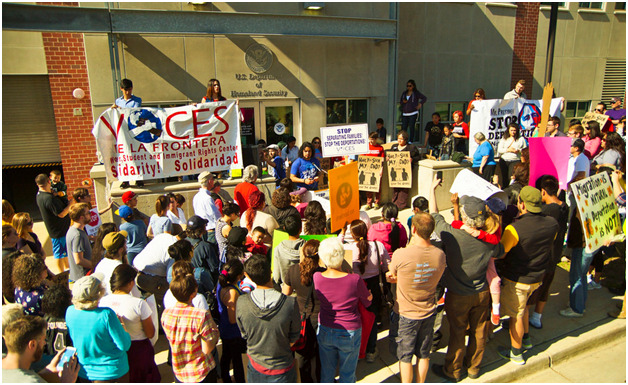 ICE raids Milwaukee families’ homes and workplaces, community fights back | Fight Back! Milwaukee, WI - Voces de la Frontera, Youth Empowered in the Struggle and community members protested at the U.S. Citizen and Immigration Services building in downtown here, May 29, to condemn the May 27 immigration raids. About 22 people were picked up and arrested at their homes and workplaces in the raids. The immigration sweep was carried out by Immigration and Customs Enforcement (ICE) in cooperation with the Milwaukee Police Department (MPD). The sweep was executed systematically, digging into government archives in order to find any excuse to validate the arrests. The victims that were picked up by the MPD were accused of bogus and irrelevant charges and included cases which had already been closed. The community members detained by the MPD are in diverse stages of the deportation process, with some of them already in the Juno, Wisconsin Detention center and some others in county jail on an ICE hold. After the arrests, MPD officers prevented any type of direct communication between the detainees and their loved ones or their lawyers. Eventually, lawyers were allowed to directly communicate with the detainees as their cases progressed. The actions carried out by ICE occurred due to a federal quota system known as the ‘bed mandate’, where all detention center beds need to be occupied. Community members at the rally condemned ICE’s and MPD’s actions and described them as variously as violent, unfair, appalling, inexcusable, inhumane and terroristic. Another target of furious chants and speeches was the Service Employees International Union (SEIU) and other liberal organizations which are asking president Obama to delay any type of executive action to stop or reduce deportations. SEIU’s statement coincides with the same day the sweep happened. "The SEIU have sold out the movement in an attempt to win over the right wing on this issue. In the meantime, more than a thousand a day will continue to be deported,” said Sean Orr, a local immigrant rights activist. “Organized labor needs to support legalization for all, not more delays."